This year, the Main Street Electrical Parade made its return to Disneyland Park. The last time the Main Street Electrical Parade was featured at the Disneyland Resort was in 2001, when it was performed at Disney California Adventure Park. It continued until 2010. Since then, you could catch the parade at the Magic Kingdom park in Walt Disney World in Florida; but the last time the parade rolled down Main Street, USA in Disneyland park was in late 1996. The parade hasn't changed much and, to some, might seem outdated—especially with the debut of a highly technological and modern Paint the Night parade during the 60th Anniversary Celebration. Nevertheless, the Main Street Electrical Parade at Disneyland is something many people, including me, remember quite fondly. I was pretty excited to see the return of MSEP, if only to see it one last time before it quite possibly might be retired for good. So, on my last trip to the Disneyland Resort, I decided to make a night of it and booked a reservation at the Blue Bayou Restaurant in New Orleans Square to take advantage of their parade dining package. Blue Bayou. Photo by Megan Walker. Operated much like the World of Color dining package at some restaurants in DCA, the Blue Bayou offers a prix fixe menu that includes a pass to view the MSEP in a reserved seating location after your dinner. It was a pretty simple setup and an easy package to book; it is reserved through the regular dining reservation site (or by phone). Payment was not taken ahead of time, which is always nice, and I didn't have a problem booking a spot about a month in advance. The package was $65 for adults, and $25 for children (not including tax or gratuity); this included a starter, an entrée, and dessert. One interesting note about this dining package is that it does not include a drink. 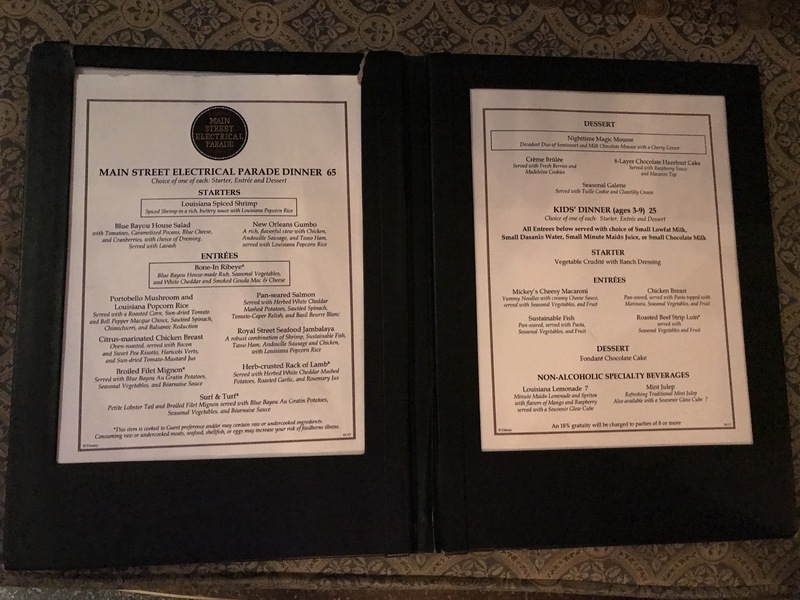 The menu for the package was the same as the regular restaurant menu, so don't be afraid that your favorite Blue Bayou entrée won't be offered. Blue Bayou's Main Street Electrical Parade menu. Photo by Megan Walker. Everything on the menu sounded amazing, so I had a hard time deciding what to choose. Eventually I decided upon the New Orleans gumbo as my starter, the Royal Street seafood jambalaya as my entrée, and, finally, the crème brûlée for dessert. In the end, I was very happy with my selections; they were delicious, as always. A close-up view of the Blue Bayou menu. Photo by Megan Walker. When we had finished our dinner, our server gave us our Fastpass tickets to get into the reserved seating area, as well a fun souvenir, light-up "pass" to wear to the parade. The lanyard on the pass lit up with different colored lights, a la MSEP, and was a fun touch. It was nothing special, but they're definitely fun collectibles, especially for MSEP enthusiasts. The Blue Bayou also has a kids menu. Photo by Megan Walker. With our lanyards and passes in hand, we headed for the reserved seating area, located near the flag pole at the front of Main Street across from the Main Street train station. There was a rather large seating area and not many people waiting in it yet, approximately 15 minutes before the parade started. We ended up getting spots right in the front on the curb—a perfect view! We were viewing the second parade of the evening and admittedly the crowds were (and usually are for the second showing) pretty scarce, but the area filled up quickly as we got the closer to the start of the parade. The front of the Blue Bayou souvenir lanyard. Photo by Megan Walker. All in all, the entire process and evening went very smoothly. We were considering Blue Bayou for dinner this trip anyway, so it wasn't much out of our way to take part in the dining package. The peace of mind knowing we'd have access to a reserved seating area for the parade, and not having to stake out a spot before the start of the parade, was more than enough to consider the package worthwhile. The seating area was superb, and, for the second parade, we were located right toward the beginning of it, so we didn't have to wait long for the parade to pass us. The back of the Blue Bayou souvenir lanyard. Photo by Megan Walker. If you're looking for an extra-special MSEP experience, or simply want to avoid having to wait for a good viewing spot, consider the Blue Bayou dining package. While a little on the expensive side, if it's possible for you to do, it can be a lot of fun and a great experience. I would both highly recommend it and do it again myself. Make sure to keep it on your radar next time you visit the parks (Disneyland also offers an on-the-go option, through Aladdin's Oasis). Now you have more time to take part in this experience, as the Main Street Electrical Parade's run has recently been extended and will perform twice nightly at Disneyland Park until August 20, 2017. I wish more people would just say no to these naked cash grabs. If you want to eat at the BB, by all means do. It's a great place. But, unless you're totally hung up on seeing the MSEP from Main St, it's easy to get a great spot for the 2nd parade. I got curbside at the last minute on a night so crowded that they announced that no viewing areas were available for the 1st parade 20 minutes before it started. Unprecedented in my experience, but still easy pickings for the 2nd. At least try to see these upcharge things for shows/parades/etc as Splurges, NOT Necessities. I booked this package for me, my Mom and Aunt for my Mom's birthday. With the prices at the Blue Bayou being what they are, there really isn't that much upcharge, especially if you order the more expensive food like the ribeye. And the food is great, the location is awesome and it's a cool, dark place to sit when it's hot outside. It was completely worth it for us, especially when it came with a benefit of having a place for my mom and aunt to sit during the parade. Was it a splurge? Of course, but Blue Bayou would have been that anyway. The lanyard is the same as what we received for the premiere party. And do you really get seating for the parade? As in, chairs? At least try to see these upcharge things for shows/parades/etc as Splurges, NOT Necessities. I don't know that anyone thinks it's a necessity. It's a convenience if you are able and willing to spend the money on it. Some people might not be able to stay late enough for the second parade, and some people might not want to risk having to look for a good spot to watch the parade if they really want to make sure to see it. Does the AP discount apply to this Dining Package? They did. I got the nice, plush sidewalk. And yes, you get an AP discount for the package. Mine was 15% because of my pass. I have to correct myself. The lanyard is similar to what we got at the premiere party, but it's not exactly the same. Well, the light-up lanyard itself might be the same, but the hanging tag isn't. OK, confused. So your mom and aunt got chairs, but you sat on the sidewalk? So there aren't chairs for everyone? To me, that would make a huge difference in deciding whether to book a package. My mom and aunt got the available benches in the area because they both have mobility issues. I am young and healthy (sort of), so I got the sidewalk. The seating is not guaranteed, though. It just happens to be in the area that's roped off. OK, that makes sense. Then I think the article is wrong in saying that the dining package includes reserved seating for the parade and should be fixed. Someone could read that and book it because it says seating is included and it's something they need, only to find out there is in fact no seating available for someone who needs it. The lanyard is similar to what we got at the premiere party, but it's not exactly the same. Well, the light-up lanyard itself might be the same, but the hanging tag isn't. Does anybody know if you get a similar lanyard if you book the Aladdin's Oasis On-The-Go Package? I have read that their viewing area is over by small world, and it would be a nice souvenir to get a MSEP lanyard for it as well.